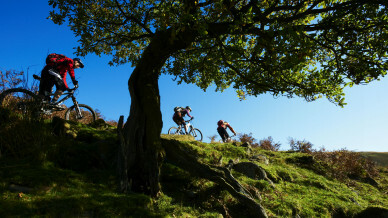 Escape from the real world and experience hills, trails and nature on two wheels with mountain biking. Whether it is the endurance and technical skill of cross-country, the speed and raw nerve of downhill, the explosive, elbow-to-elbow spectacle of four cross, or even a family trail ride; mountain biking offers something for everyone. There are thousands of miles of accessible off-road routes across the country with opportunities to experience a great day outdoors at one of Great Britain’s world-class trail centres. Or you could even take your first steps into the world of mountain bike marathons! Whatever you fancy, mountain biking is diverse enough to offer a world of opportunities for everyone. 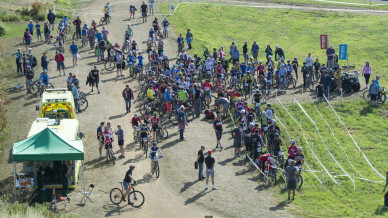 Mountain bike racing takes place in a variety of off-road venues. 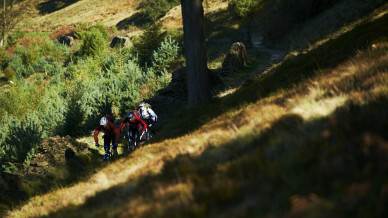 Cross-country races often use parkland, woodland and forestry sites, with the terrain chosen to incorporate climbs, descents and technical features. Looped courses are designed and built specifically for events by skilled course designers, with man-made technical features such as ‘rock gardens’ incorporated to increase the technical challenge. 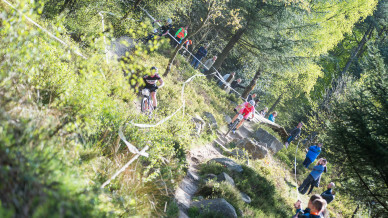 Downhill courses are shorter point-to-point courses exploiting a venue’s steep terrain, incorporating technical features such as rocks, tree roots, jumps and drop-offs. Like cross-country courses, these tracks are often created specifically for events or form part of a trail centre or bike park’s established courses. Four cross courses are, like downhill courses, built on steep terrain with manmade jumps, berms (banked corners) and other technical features. They’re much shorter than downhill courses but wide enough for four riders to compete shoulder to shoulder. Away from racing, the ‘venue’ for recreational mountain biking is huge; it’s the great outdoors. Britain’s network of bridleways and other legal rights of way extends to thousands of miles. For the adventurous type with a bike and an Ordnance Survey map, it’s ripe for exploration. If, however, you like your riding more ‘point and shoot’, mountain bike trail centres are where it’s at, with way-marked, graded routes, generally in forestry land, with all the amenities such as bike hire, bike wash, bike shop, cafe and changing facilities provided. Think of them as one stop shops for mountain bikers. Mountain bikers come in all shapes, sizes and ages. 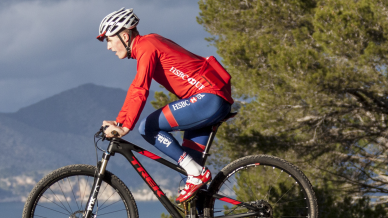 Cross-country suits light riders with great endurance and technical off-road ability. Downhill and four cross is more explosive, favouring more powerful sprint athletes. 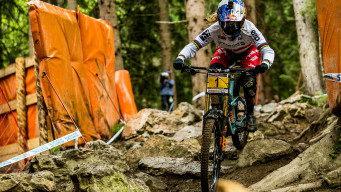 Mountain bike racing has categories for all ages and abilities, from fun races to mountain bike marathons to elite competition at world and Olympic level. 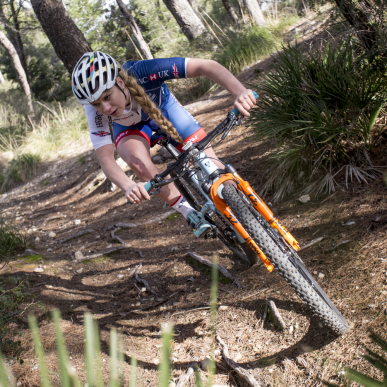 Away from racing, the mountain bike scene is huge, with trail centres throughout the country offering routes to suit a wide range of ages and ability levels. 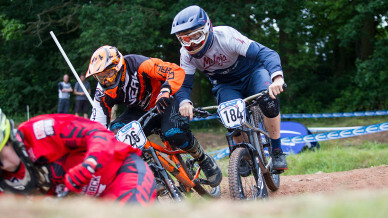 Downhill races start with practice runs, when riders can learn the course and set-up their bikes for the particular demands of the terrain and the conditions. Practice is followed by a timed run, often used to seed riders for the final, with the fastest rider from the timed run going last, which always builds tension and excitement as leaders are deposed one by one from the ‘hot seat’. 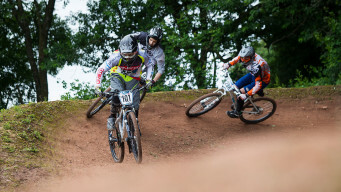 Four cross races pit four riders against each other on a steep, technical track. Riders race from a mechanically-controlled, BMX-style starting gate. Events begin with qualifying rounds or motos progressing through knockout stages until the final is reached and an overall winner decided. The format varies depending on the level of competition and number of riders involved. Often abbreviated to XC or, at international level, XCO, cross-country races vary in length depending upon the category of rider, usually from around 30 minutes for youth riders to 1.5 to 2 hours for seniors and elites. Races are run on multiple laps of a cross-country course. Cross-country is a mass start race with large fields, often over 100 competitors, so getting a good grid position and a good start is vital. In the race, unlike road racing, riders must be self sufficient and can only get mechanical assistance in a dedicated technical zone. Again, unlike road racing, large groups seldom form due to the nature of the courses, with riders often battling alone or in small groups of three or four. What is the cross-country eliminator? A short, explosive and spectator-friendly form of cross-country racing, sharing much with the four cross racing format. Four riders compete on a short course with races just a few minutes long. Competition begins with qualifying heats before progressing through knockout rounds until only four riders remain for the final. What is the cross-country marathon? Marathon events share much with standard cross country events but differ in terms of race length. Races often take place on much longer courses than cross-country or use multiple laps of a cross-country style course. 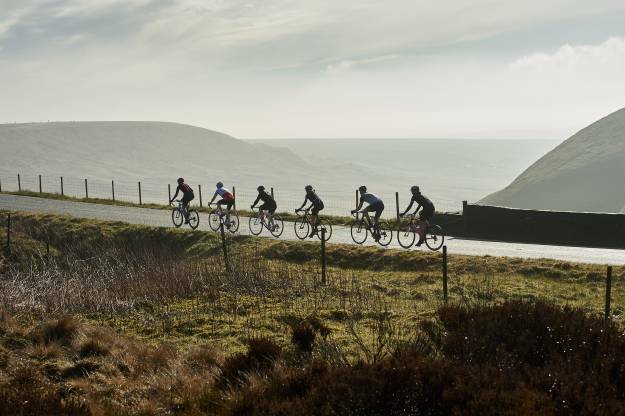 There are marathon events for all levels of rider from popular mass-participation events like Mountain Mayhem to UCI ranked world championship level events for elite riders. 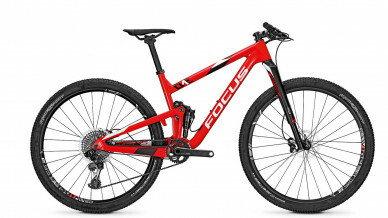 Cross-country bikes are lightweight, generally with front or dual suspension, strong brakes and a wide range of gears to cope with mixed terrain. As with all other mountain bikes, they have knobbly tyres of around two inches wide, which allow for off-road access. Downhill bikes are much more robustly built, with longer travel suspension, tougher wheels and tyres and different frame geometry. They’re designed to do one thing very well; go downhill fast. Four cross bikes are somewhere in between; specialised machines with small agile frames and a long travel front fork, honed for the demands of the four-cross track. Mountain biking is a year-round sport, so it’s important to dress according to the weather. You may prefer to wear cycling-specific jerseys that will help to draw moisture away from your clothing. Top-level mountain bikers will wear padded cycling shorts, but you can also get baggy mountain bike shorts with hidden padding that still offer comfort and protection. For winter rides, a lightweight rain jacket can protect you from the elements. 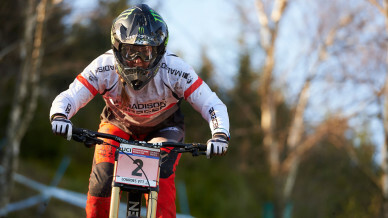 Downhill mountain bikers use helmets that look more like a motorcycling helmet than the traditional cyclist’s helmet as they have full-face protection, essential given the high speeds riders reach on often dangerous terrain. Mountain bike helmets have visors, enhanced rear-head coverage and a firm, secure fit. They’re designed to ventilate well at low speeds. Given the thrills and spills of mountain biking, body armour can massively reduce the likelihood of injury. Hard-shell armour is best suited for gravity-style riding on technical terrain while soft shell armour is designed for more regular use on trail riding. Knee pads should be light and non-restrictive so they don’t hinder pedalling. Mountain biking is best watched up close and personal, where you can really appreciate the athleticism and skill of those taking part. 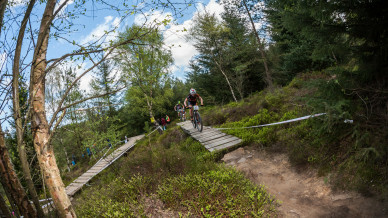 The environments that mountain biking take place in are often spectacular and the culture at events is relaxed and exciting, with many events having a festival feel. 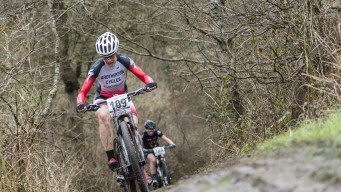 There are a number of mountain bike specific clubs across the country, that organise club training rides, support entry to events and lead recreational rides. Meanwhile, there are Go-Ride clubs throughout the country that run mountain bike skills sessions to help young riders get into the sport, teaching them the essential techniques of off-road riding. 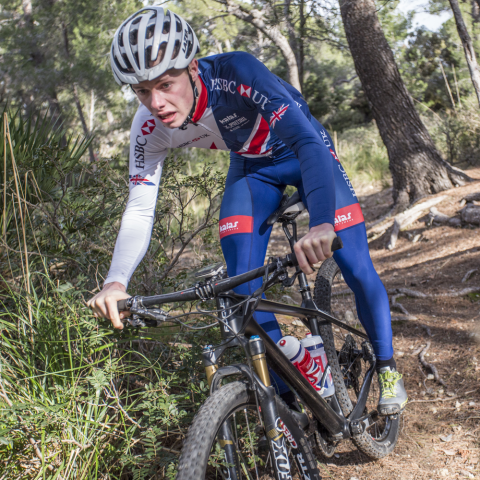 The mountain bike racing season extends throughout the year, with the main racing season running from spring to autumn while various winter series ensure there is racing for four seasons. There is racing for all age groups and a range of abilities. 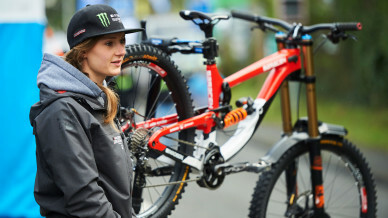 Support the sport by volunteering your time and skills at your local mountain biking event. There are opportunities for a variety of roles including timekeepers, judges and marshals. 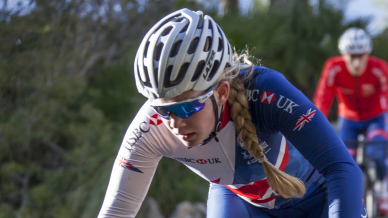 British Cycling has a range of volunteer education courses to support your development. When riding off-road, good skills are as important as fitness. 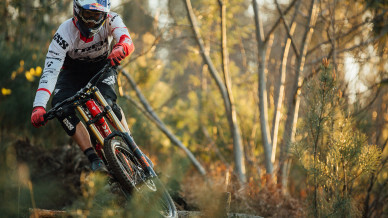 Develop your mountain biking technique with our Insight Zone videos and articles, or look up your nearest coach for some pointers out on the trail. Mountain bike leaders are trained and insured to help you explore the best trails. Anyone can become a leader, you just need to be a competent rider and committed to giving fellow off-roaders an experience they’ll never forget.